Sara and I are on our way home from Des Moines today! If you haven’t had a chance to vote today in the Better Homes and Gardens cook-off and you’re feeling the urge, please click here to vote for us. And don’t forget to enter the current giveaway for the Non-stick Porcelain Cookware! Somehow, in the 2 1/2 years that we’ve been doing this blog, we’ve never posted a bread pudding. I’ve had it on the calendar so many times (just wait…bananas…croissants…caramel…I’m not sure why it hasn’t happened, but when it does, it’ll be awesome), but it seems like it always gets bumped. Or I don’t want to make it. Or it’s too hot. Or some kind of lame excuse. I saw this recipe on Twitter a few weeks ago and knew that I needed to make it because, after all, I am a sucker for caramel. And apples. And bread. And pudding. as well as heavy cream, milk, and spices, which are equally important but also a part of the great photograph disappearing act of 2010. If you can leave them out for a few hours so they get nice and dry, that’s great. If not, just place them on a baking sheet and bake them at 350 for 10-15 minutes or until they’re dry but not toasted. 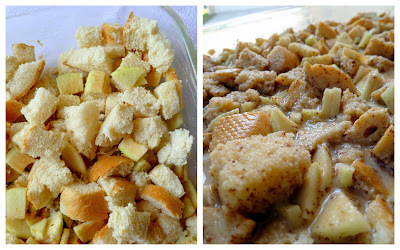 Toss the apples and the bread cubes together in a large bowl and then place them in a greased 9×13 dish. In the same large bowl, whisk together the remaining ingredients except the butter and pour the mixture over the bread and apples. You want to let this stand for awhile so the egg/milk mixture gets soaked into the bread. Ideally, you could cover it and refrigerate it overnight, but if that’s not possible, you can let it stand for 15 minutes-1 hour. When the bread has soaked in most of the egg mixture, place the pan in the oven and bake for 40-50 minutes or until the center is set and the apples are tender. Allow to stand for 5 minutes and then cut into pieces and serve warm. What you really want to do is drizzle some (okay, lots of) Buttermilk Syrup (this is where the “caramel” of the “Caramel Apple Bread Pudding” comes in) over the warm piece of bread pudding. If you’re feeling especially rebellious, you could add some vanilla ice cream, too. So evil, right? Right. *If possible, cut the bread into cubes and leave it out for several hours or overnight. If not, place the bread cubes on a baking sheet and bake for 10-15 minutes or until the bread cubes are dried out but not toasted. Preheat oven to 350. Lightly grease or spray a 9×13″ baking dish with shortening or non-stick cooking spray. In a large bowl, toss together the bread cubes and the apple pieces. Transfer to the baking dish. In the same large bowl, whisk together the remaining ingredients except for the butter. When combined, continue to whisk while pouring over the bread/apple mixture (just to make sure the spices are evently distributed). Gently combine the bread and egg mixture, making sure each piece of bread is soaking in part of the egg and milk mixture. Allow to stand for at least 15 minutes (longer, if you can; you could even do this the night before, cover it tightly, and then bake it in the morning). When the egg/milk mixture has mostly soaked into the bread, dab the butter over the bread and place the baking dish in the preheated oven and bake for 40-50 minutes or until the center is set but not dry or burned. Have a wonderful weekend and thanks for the recipe! Funny story about this post: as I was reading through it (and drooling over the pictures) my one year old came over and just stared at the screen for a few minutes. Then he started rattling off "I want bread. I want dinner. I want cookie. I want cake. I want dinner. I want eat. I want cake." (this is getting increasingly louder and more and more desperate.) Kind of laughing, I said "what do you want?" He jabbed his finger at the picture on the screen and started screaming "I want that! I want that! I want that!" Your pictures are so mouthwatering even my one year old recognizes the deliciousness behind them. I've been waiting for a bread pudding recipe from you guys … knew it would just be a matter of time!! Thanks for posting, YUM! Sorry to ask, but would there be a substitute for the heavy cream? Maybe something a little lighter? You've done it. You've finally completed posting my trifecta of weaknesses: cinnamon rolls (many times), French toast (particularly with buttermilk syrup), and bread pudding. Oh good heavens, life is delicious. P.S. Heavy cream works the best for bread pudding, in my experience, but I've used half-and-half without sacrificing much. Oh yum!! That looks soo scrumsciously delicious! I am going to be trying this one out really soon! P.S I've been voting!! 🙂 Good luck!! So far you two are way ahead, and I hope it stays that way and you end up winning, so we can win too! That pan set looks awesome!! Yummy is right. But it looks like a quick way to put on three pounds. OMG! I think I've died and gone to heaven. You've managed to find a recipe that combines all of my favorite things – bread, caramel, and apples. I'm on a diet – but I'm going to have to try this!!! Yummy. I'll have to figure out a way to reduce the caloric intake. This was my first time making/eating bread pudding. OMG it was amazing! I'm not a huge apple fan…..actually I dislike them alot. However, my husband loves apples and I love caramel. So I chopped the apples very small, and poured tons of the "caramel" on top! It was sooooo goooood!!!! Okay, honestly, I've always been a bit skeptical about bread pudding. That just sounds weird! But this looks way too awesome not to try… yum! Holy cow, I saw this and knew we had to have it for breakfast this morning. It was so good I almost died. I have tried a bunch of breakfast type casseroles like this and they are not THAT amazing. THIS, was. I added extra apples and wow! BTW, HWFA I didn't have all the ingredients for this, namely the cream so I had to adjust. I used my homemade whole wheat bread, 5 whole eggs and 3 cups 1% milk. It probably doesn't taste as amazing, but it is still way good and pretty healthy that way. I figure this way is for breakfast and the original is for dessert! Those are the kind of modifications I need to turn this into a breakfast dish 🙂 I'm definitely going to try those adjustments for breakfast and then compare to the 'original' for a dessert dish. Two recipes in one!! Of course the buttermilk syrup will have to go on both! Thanks for your feedback, so helpful! I came up with a recipe almost exactly like this a while ago and make it all the time. I tend to collect bread cubes for a while (I love artisan breads but can't seem to finish a whole loaf quick enough, so when end of the bread is close to getting stale, before it molds, I actually cube it and leave it out on the counted to dry out completely and save them in a ziploc) and when I have enough, this is what I make. I drizzle the carmel over it before it bakes and it works well too. Yum, what a deliciously gooey dessert. I made this over the weekend and it was AMAZING. Since I'm not supposed to have a lot of sugar, I used Splenda sugars, and I used sugar-free caramel I found at Walmart. It was still pretty darn tasty. 🙂 Oh, and I added some chopped pecans on top because I like a little bit of crunch with ooey-gooey desserts like this. And that caramel sauce is to die for. I love caramel and have made a dozen different kinds, but I think is my new favorite!! omgee! this sounds amazing! i'm gonna go get some apples out of our tree today and whip this up…& i think i'll serve it with your easy dulche de leche! mmmm….sounds so yummy & rich…can't wait! thank for all the awesome recipes…they always turn out wonderful! hugs! This is the best bread pudding ever! I used light evaporated milk instead of milk and threw in some leftover butterscotch chips and brandy-soaked raisins and WOW!! Thanks for the super recipe!! Made this last night. The Almond Extract is a bit overpowering. It isn’t in CH’s original recipe. I think I’ll leave it out next time. Still tasty. Thanks. AMAZING RECIPE!!! After eating at one of the upscale restaurants for valentines day, we had an amazing Bread pudding with caramel sauce. My husband was skeptical but after tasting that was game to try it at home. When I found this receipe, I was actually sucked in by the nice site. I made the bread pudding for a family event. It was amazing (I might say better than the restaurant’s version). Although no one except my Grandmother (who by the way is an amazing cook) commented on it. I offered to make it for Easter and there was an overwhelming YES! My wonderful Grandmother even asked for the recipe. Made this last night for a party – it turned out great! Thanks for the recipe! I actually made it a full 20+ hours ahead of time, and it was good (I was a little worried that doing it longer than just “overnight” would be too long)… I did stir the bread a bit with the gooey stuff just before I popped it in the oven. The caramel sauce is a FANTASTIC recipe too. I was amazed by how simple it was!!! Will you add a PRINT option to this recipe? Thanks! 3 egg goals the recipe calls for? I made this and wrote about it here. Absolutely wonderful. Now I look forward to stale bread, just so I can make this again! Thanks for sharing it. Wow, this looks delicious, you’re giving me a Sugar Rush just looking at it! I just wonder because the amount of bread is not a very precise measurement. Can you describe how soupy it should be when the 15 minutes is up. Then we could tell if we need more bread or more milk/egg mixture. I can’t wait to taste it!! So I fell in love with bread pudding after having some at Kneaders and was super excited to try this. I made it last night/this morning and forgot to put the 4 whole eggs in it and just NOW realized it. While eating it this morning I thought it was incredibly soupy and was shocked that one of your recipes wasn’t good but nope, I’m just a moron. I’ll have to try it again… Don’t forget the eggs, people! I have looked and looked for a good bread pudding that I know would be good (I love the stuff). Well now ive found one!!! Gotta make it this weekend. Thanks a bunch!!!!!! The link to the Buttermilk Caramel Sauce is still broken…it has been a year, now!!!!! could you send me a copy of the recipe?? Hi Nancy. I just checked the links and they work for me. However if you ever find a broken like on our site, simple google “Our best bites [insert recipe name]” and it will pop right up. You can also go to our recipe index and find things that way. Here is the direct link to the caramel syrup. Enjoy! This is the absolute epitome of dessert perfection! I found your recipe 5 years ago and have made it every year since for Christmas! My whole family, extended included, love it and beg for more! This year I quadrupled the caramel sauce so everyone can have extra! Love it, love it, love it! I was not a bread pudding person until I tried this recipe. And for added sweetness I use Honey Crisp Apples! Next Post ❯ Next post: Sara & Kate at the Better Homes and Gardens Cook-Off!